The Chocolate Doctor is located in the Greater Toronto Area. If you are interested in any of her services please use the form on the contact page to get in touch. Kerry has taught dozens of people. Her students range from those who just want to learn a specific technique to those who want to start their own chocolate businesses. Looking for that perfect, unusual birthday gift? The gift that nobody else has considered? We think that a chocolate session with Kerry Beal fits the bill. From a nine or 10-year-old who just wants to wallow in chocolate to an adult who has always been curious about how to make beautiful molded chocolates this is the answer. Treat your BFF and come along for the ride. A morning or afternoon with the two of you learning the secrets of chocolate making will make memories that last a lifetime. Have a favourite niece, nephew or grandchild who would love to spend an hour or two decorating Oreos, dipping liquorice sticks or rolling truffles? Bring them and their best friend for an enchanting afternoon getting up to their eyes in chocolate. Got a wedding in the works? Need wedding favours but would rather make than buy? Consider learning how to make and decorate truffles. A three hour lesson with Kerry will give you all the skills you need to turn out unique and delicious favours. You and your maid-of-honour can really bond over chocolate! Kerry uses only pure Belgian chocolate. From available water (aW) and pH testing for improved shelf life to troubleshooting production lines Kerry Beal has the tools and experience to help you. There are few tools or instruments in the chocolate world that Kerry doesn't own or is not familiar with. A Selmi and panning equipment take up a large part of her chocolate room. 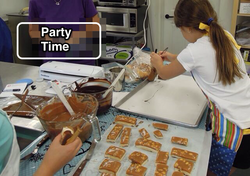 Recipe development and refinement rate highly among her skills and interests. She draws on her solid science background to help boost flavour and increase shelf life in all manner of confectionery. She has a wide network of experts to draw on when unique problems require specialized ingredients or equipment. If you are the fundraiser for a registered charity consider hiring Kerry to draw in contributors. Her continued popularity at the annual Toronto Luxury Chocolate Show is a fine testament to her crowd pleasing skills. 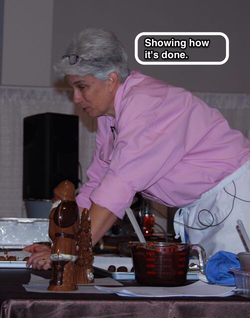 From demonstrations on how to make molded chocolates to hands-on opportunities to decorate chocolate dipped confections, Kerry can help you plan the perfect way to raise funds for your organization. The EZtemper is my solution to fast, affordable, professional chocolate tempering results in the shortest time possible.